Members: Help ICCE to achieve excellence? A Framework of universal core values, seven areas of court excellence aligned with those values, as well as concepts and tools by which courts worldwide can voluntarily assess and improve the quality of justice and court administration. 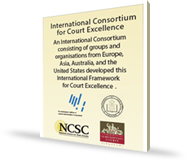 A self-evaluation process using the Court Excellence Self-Assessment Questionnaire that evaluates a court’s performance against seven areas of excellence, and provides guidance for courts to improve their performance. The Global Measures of Court Performance include eleven focused, clear, and actionable core court performance measures aligned with the values and areas of court excellence of the Framework. The Consortium will regularly edit and revise the Framework to reflect new developments for improving how courts and justice-system partners deliver services. If you would like to sign up for the ICCE mailing list, please contact Kent Kelly at kkelly@ncsc.org.